I loved that little insight. Many hands make light work, but many hands also make more work for the many hands to make light of. It’s a cycle. This funny misquote came at a time when I had recently had a few conversations with people about the amount of work required with different numbers of children, so it prompted me to think a bit more about this whole topic. Truthfully, I do sort of laugh at myself when I remember the early days. I can remember when Lina was born that I was shocked (shocked!) by the dramatic uptic in laundry needs. There were things that needed to be stain treated, there was a lot more laundry all the time. But now, with Shadrach fresh on the scene, I can honestly say that I haven’t noticed any change in the laundry at all. None. I know he is contributing, but I already live under a regime of three loads a day or die, and since he can spread his laundry needs out into those three loads, nothing seems different. Even he can not require a full load to himself every day. I know that some of you out there are far ahead of me in number of kids, or ages of them, experience, and technique. But, having six children has taken me into the kind of territory where new mothers say they are tired, then qualify it. They say they are busy, then say they don’t know how I do it with six. They feel swamped with three, but they hasten to point out that three is not very much. They feel constantly like they have no excuse for this. Other people have more to do, less sleep, and appear to be handling it all with ease, or at least with easier. In some ways it is true – I know that I am more capable now. I have more experience, and I am slowly turning into what mothers are supposed to be: the kind of person who probably has burritos in her purse. I have arrived at the phase where your children give you trash with the expectation that you have a garbage facility with you. Turns out you do. I am turning into the kind of person who starts getting ready for things much earlier than my younger self thinks is necessary. I have learned about some things, because I have had to. And I’ll admit to smiling to myself when a new parent explains sleep deprivation to me. I’ll admit that my husband and I look at each other and wonder when the last time we slept all the way through the night was. Because there are nightmares and accidents and bloody noses. We wake up for seven different bladders. We are not people who expect to sleep through the night or sleep in on weekends, and that is certainly different. In other ways, I know that what I am doing now is easier. When the twins go to pre-school in the morning, and I am home with only Blaire and Shadrach, I get a little flashback to the old days. Holy Wild. It is a festival of “Look at me! Watch this mom! Read this! Let’s go on a walk! We go on a date??? ?We play battleship??! Here’s the jam, I’ve got a spoon!” all while I am nursing or bouncing an infant. It is very different, and very demanding. When I just have the littlest, I am not a supporter of their world, I am the whole thing. That is a burden that I didn’t even notice I was sharing with my other children, because it isn’t like they were doing my work for me. It is just that when everyone is here, it is like everyone is holding up their corner of the blanket fort. Together we make it fun. Together we make a little world. But when they are off learning, it is back to me as the main pole in the circus tent. It is simply different, and not in a less hard, more hard way. Different mental energy, different physical energy, different everything. It reminds me of making snowmen. We are all out in the snow trying to make snowmen. That is the goal, the purpose, the mission. When you are first starting out, it can be pretty rough going. Sometimes the snow is pretty powdery and won’t stick together. Sometimes your mittens are making you feel clumsy. Sometimes those tiny little snowballs are stupidly hard to get rolling. Some conditions are simply hard to work in. It is at this time when you might look over and see some other family with a perfect sphere, chatting cheerfully as they roll, and beyond them is a couple tying on scarves and making cheerful smiles out of gravel. It is easy to think that those people can’t imagine why you are scrabbling around on the ground, soaking out the knees of your snow pants. You might feel really embarrassed that you are completely fizzled out by 10:30 in the morning. The reality is that while we are all trying to build snowmen, we are not all doing the same work. Same project, different work. I feel like our family is now off of our knees, but now we are struggling, backs against our snowball, snow boots scrabbling on the slick snow while we try to get this bottom snow boulder into the right place. We have a lot more to do, but right now we are absorbed in the placement of the first layer. The intensity of that first little start is a really helpful foundation for the future. You go through a phase that is a sort of psychological thriller. It is all intensity, all physical. I refer to it fondly as the sweaty eyeball phase. I feel like God gives us this phase to really start training us for the next thing. We need to learn sacrifice, patience, and self control. We need to discover that there is a world beyond ourselves. But then, there is a sort of a window where things might start feeling a little more under control. You might think you sort of got this thing going, and it is pretty easy now. That is the phase where the snowball is now rolling successfully, and growing, but it has not yet gotten so big that you are slowing down, or getting exhausted. You can’t stop right here, because you are supposed to be over there, but you can tell that it is going to rest somewhere soon. The foundation is getting set. You will not have the strength to move it after this. And that is a different kind of pressure. 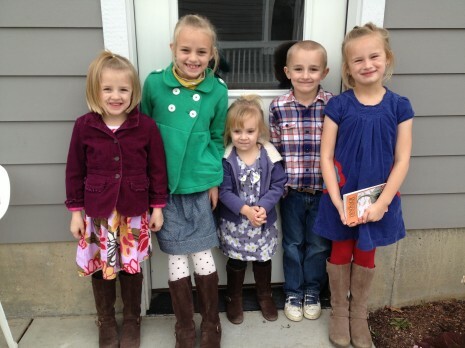 This is the phase where God brings us to our knees as we see these little people as individuals. As people whose life stories are being written, by us. We see ourselves as the childhood makers, and we see for the first time, how short this time really is. It is easy for a sense of crisis, of panic, of insufficiency to set in. Gone are the days where clean clothes and clean diapers and food are enough. Welcome to the days where you are befriending your children, counseling them out of grumpiness, praying that they will feel guilt over the lie you are pretty sure they told you. I know that there are more struggles, and more challenges after this bottom snowball settles. I know we will go through different phases – different kinds of formative years. I know that the unique challenges of each different phase are here because they are hard for us, and good for us, and because we will need what we have learned through the course of it for the next phase of construction. Rachel, I can’t tell you how encouraging this post was for me! As a Mommy of two rambunctious little toddler boys, I’ve definitely been living in the “all intensity, all physical” phase. Thank you for the mental picture… I just have to keep rolling. I know this powdery mess will all start to stick together soon! I love this–so great and exactly what I needed to hear right now! Thank you for the reminder that God gives us phases to train us for what is next! What I’m waiting for is when my kids are 4-10x the size they are now. Does that mean 4-10x the laundry? But this really was good. Book three, chapter one…ready go! The burritos in the purse made me laugh. So very, very true. Thanks for another insightful and encouraging post! Rachel, glad to hear that we will get off our knees scrambling to get the ball started, how imprtant to lift our heads, our eyes and see the light above us, in every sense. Yes!! I feel this pressure heavily now! My “littles” are 10, 8, 4, and 1, and I keep imagining our days on 8mm film. I just had my 4th and people think I must be that much busier and I often say it doesn’t matter if it’s your 1st or 4th, a newborn is a lot of work and new moms are tired – I’m not more tired because it’s my 4th, in fact I’m used to it and know what to expect. But it’s true like you said, when they’re all home, it is chaos, but at least they play together, when it’s just one, it’s Mommy, Mommy, Mommy. Terrific insight, a blessing to read as I’ve been thinking on this topic lately. A lot. Just on the cusp of that panicked begging for grace phase. Thanks for the encouragement! This might be my favorite thing you’ve written yet, Rachel. As a mom who struggled with secondary infertility (in the form of recurrent pregnancy loss) after having only one child, there are some sentences in this post that blessed me more than I can tell you. It’s like someone “got it” ~ some of the things I haven’t been able to put properly into words for the last five years. The Lord continues to work through you and your words, and we praise Him for that. Thank you for letting Him use you. I just gave birth to my eleventh baby and you are sooo right…..I agree with everything you said! I love having ‘older’ children in the house at the same time as the ‘littles’ and no, life isn’t really that much more difficult now than it was with four or five or six….more work? Yes! But what a blessing they all are! I’d like to hear about dresser-less clothing storage. I have mulled over the clothing storage thing quite a bit and have never been able to put into practice what I’ve imagined. Woah! I’m right in the “praying my son will feel guilt for the lie he told to my face- make that twice this week!” my preciouse boy, I’m so thankful that God holds us all in his hands and that he loves and cares for my children more, infenatly more than I do or ever could. Thanks for this reminder that these are all fazes and they are good for learning. Oh and I was just thinking about your laundry method today as I was re washing clothes that had sat too long in the washer! Yuck! Thank you for this! I have a 4 year old, 2 year old, and a six week old. I’m pretty sure you coined the phrase, “Motherhood in the Trenches.” I am trying to enjoy this stage, and still look forward to simpler, or uh, more stable days ahead! I don’t know what a Burrito is, and we don’t get snow, but I loved this post:-) also, just wondering how you respond to “wow, so many children!” Etc. There’s a weird, unwritten rule here that 2 kids is the right number.